“Italian Cultural Notes” on this page were adapted from Conversational Italian for Travelers textbook for www.LearnTravelItalian.com. Follow Caterina in the Conversational Italian for Travelers series of books! One of the first things Caterina must do after her plane lands in Italy at Milan’s Malpensa Airport is find her way to the city of Milan. You can learn about how to do this at learntravelitalian.com/interactive.html from one of the many free, interactive dialogues on this site. But what if we want to begin our Italian adventure in Venice and land instead at the Marco Polo Airport on mainland Italy just outside that magical city of islands? Read on to the next section, Italian Cultural Notes, and find out all about transportation to and along the waterways of Venice! The Marco Polo Airport serves the city of Venice and is located on the mainland, near the town of Mestre, just across the lagoon. The major island of Venice (Venezia) is connected by a bridge to the mainland and is served by a local train station and a large bus station. A city bus or taxi can be taken over this bridge directly into Venice from the airport. 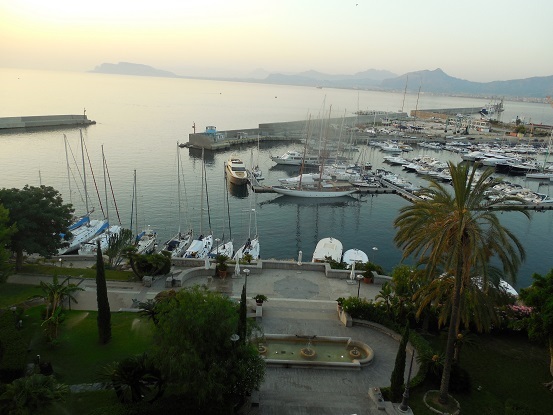 You can also take a taxi ride to the train station in the nearby town of Mestre on the mainland. The trains in Mestre connect with towns on the mainland and to the Santa Lucia station in Venice. Unique to Venice are the water ferry and water taxi. 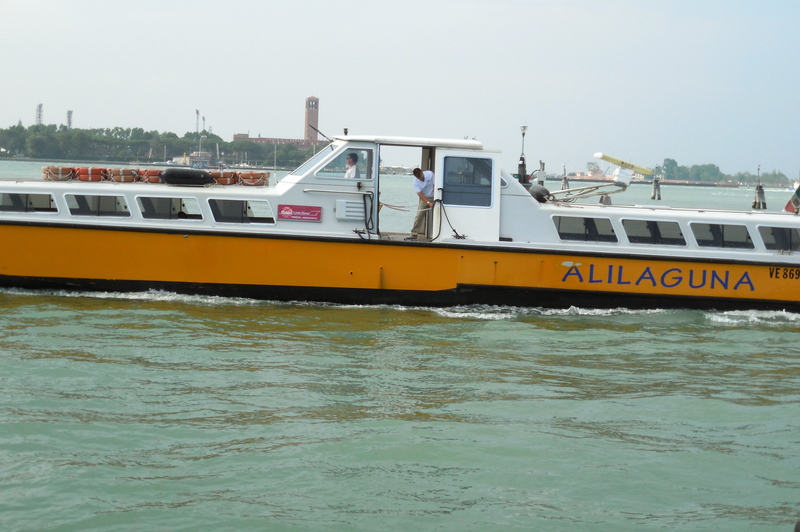 Take the yellow Alilaguna water ferry to Saint Mark’s Square in the main island of Venice or to the beaches of the island of Lido from the Marco Polo Airport by following the covered walkway from the arrivals desk to the nearby dock. The walk takes about 10 minutes, so it may be necessary to hire a taxi if you have a lot of baggage or have difficulty walking. Tickets can be purchased at the arrivals desk in the airport or at the dock once you arrive and are about 15€ one way. The trip takes 1–1½ hours, depending on the number of stops made along the route. Also along the same dock are smaller, private water taxi boats that can take travelers directly to their destination. 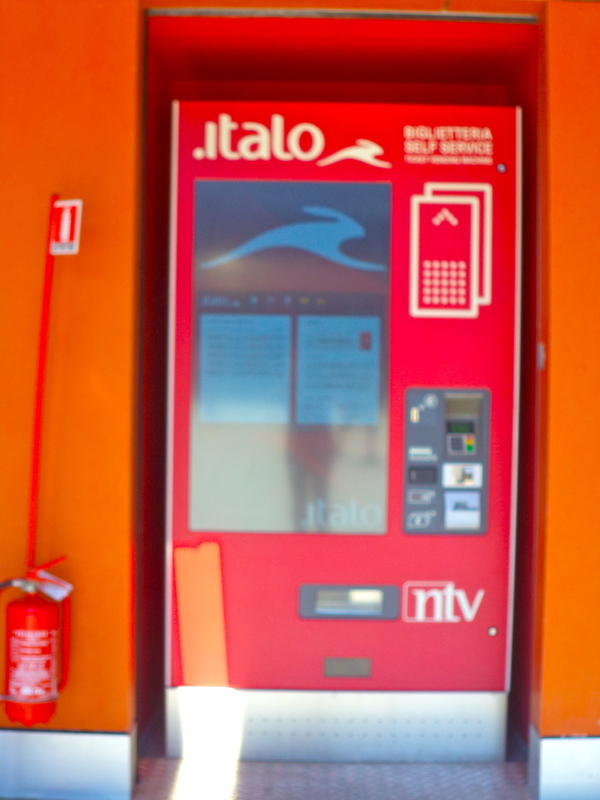 Once in Venice proper, purchase an imob.venezia card for the length of your stay (4 days, 7 days, or longer) for the public ACTV water bus system to get to all of the major sites on the islands. This card can also be used on the local bus system on the Lido Island. 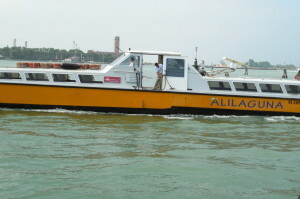 Private water taxis are also available at most docks on all the islands of Venice. And of course, for a leisurely ride through the smaller canals, try the classic sleek black gondola piloted by one oar by one of the trained gondolieri in their black-and-white striped uniforms! One of the first things Caterina must do after her plane lands in Italy and she passes through customs is find her way on the Italian railway system. To listen to dialogues from Chapters 4 and 5 about Caterina’s encounters as she buys a ticket and boards a train in Italy, go to the interactive dialogues on our website at learntravelitalian.com/interactive.html. The Italian Cultural Notes section that follows, also from the textbook, gives a bit of insight into how the Italian railway system works. After Caterina arrives in Italy at Malpensa Airport, about 50 km northwest of Milan, she must then make her way into the city. First, she takes a taxi to the nearby town of Gallarate to get onto the local train system, called Trenitalia (www.raileurope.com/Trenitalia-Italy). This local railway cannot be accessed directly from the Malpensa Airport, but until recently, it was the only way to catch a train after flying into Malpensa. The train line from Gallarate goes to the largest terminal in Milan, the Stazione Centrale. Gallarate can also be reached by bus from Malpensa Airport for a small fee, about 1–2 euros, and buses leave regularly from the airport all day. Of course, there are also bus routes to many other nearby cities from the Malpensa bus terminals, including to Milan, for those who prefer to take a bus for the entire trip. When at the Gallarate train station, Caterina asks for a train that will take her directly to Stazione Centrale, avoiding the possibility of having to change trains along the way. A typical train ticket from Gallarate to Milan should actually cost less than we have noted in the dialogue, and it takes between 40 and 60 minutes to reach Milan. A newer, separate train system called the Malpensa Express, which opened in 1999, leaves directly from Malpensa’s Terminal 1, underground floor, every 30 minutes. As the name suggests, this train goes directly into Milan, but it ends at a smaller station, the Stazione Cordona. The Malpensa Express trains are new trains with only first-class seats and luggage areas between compartments. Nonstop trains are available in the mornings and late at night, but during the day, there are a few additional stops along the way to Milan for the 40-minute trip. To learn more about the Malpensa Express trains or to view a train schedule and current ticket prices, go to www.malpensaexpress.it. In our dialogue, the ticket agent Rosa very kindly reminds Caterina to validate her train ticket before boarding the local train. In Italy, when using the local train system, it is possible to buy an “open” ticket, which can be used at any time within a 2-month period. Stamping each ticket with the date and time before entry on the train prevents this type of ticket from being used more than once. The name of the machine that is used to stamp the date and time onto the ticket is translated by the makers of the machine as a “ticket canceling machine” or macchina obliteratrice. 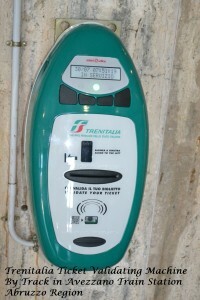 The older machines are yellow, but the new machines now in common use have a green and white face with the Trenitalia logo and name along the top. These small machines are usually found attached to the wall at the entrances of the individual train tracks, which are usually on the lower level of the train station. When referring to what the machine actually does, you can use the verb timbrare, which means to stamp, or convalidare, which means to validate. The verb obliterare, which means to cancel, also means to stamp or to punch when referring to tickets. In effect, all three verbs apply, because the ticket is literally stamped, which validates it for travel, and is canceled for further use at the same time. After boarding the train, the ticket inspector (il controllore) will come through each car and ask to see each passenger’s ticket. If the date and time have not been stamped on the ticket, that passenger will be asked to pay a cash fine before leaving the train. Signs are sometimes posted on the interior doors of the trains warning of the fine to be paid if the ticket has not been convalidato (validated)—in Italian, with no English translation! Tickets for the Malpensa Express also need to be validated. So remember to look for those little yellow or green and white machines each time you board a train in Italy and stamp your ticket the way Caterina did. It takes only a second but can save a good deal of money! A word about the other major airports in Italy: Alitalia flights into Milan used to land primarily at Linate Airport, but nowadays, most passenger airlines land in Malpensa, which is the second largest international airport in Italy. Rome’s Leonardo da Vinci Airport remains the largest international airport in Italy. It is located 26 km west of Rome, and the nearest city is Fiumicino (which is the old name the airport used to go by and is still used for the airport code: FCO). 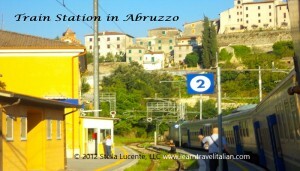 It is very simple to take the train from this airport to downtown Rome. Just follow the signs to the ticket counter, or buy a ticket at the on-site Alitalia office or from an automatic ticket machine. After a 30-minute ride, the train ends at Roma Termini, which is Rome’s central station. The Marco Polo Airport serves the city of Venice and is on the mainland, near the town of Mestre, just across the lagoon. The major island of Venice (Venezia) is connected by a bridge to the mainland and is served by a local train station and a large bus station. A city bus or taxi can be taken over this bridge directly into Venice from the airport. A taxi ride to the nearby town of Mestre to the train station is possible and will connect you to points north of Venice on the mainland and to the train station in Venice, the Santa Lucia. Follow Caterina and learn how to make YOUR Italian reservations in the Conversational Italian for Travelers series of books! Making Italian Reservations for YOUR Summer Vacation—or Any Time! Because Caterina visits Italy during the summer months for our story, she is able to join her Italian family on their traditional trip for the Ferragosto holiday that takes place on the week of August 15. As part of their preparations, Caterina’s sister-in-law Francesca asks Caterina to make hotel reservations for their family at their favorite family-run lakeside resort in the town of Stresa. Listen in on Caterina’s conversation with the hotel manager at our website www.LearnTravelItalian.com and learn important Italian phrases that may be useful to plan YOUR vacation in Italy this summer! 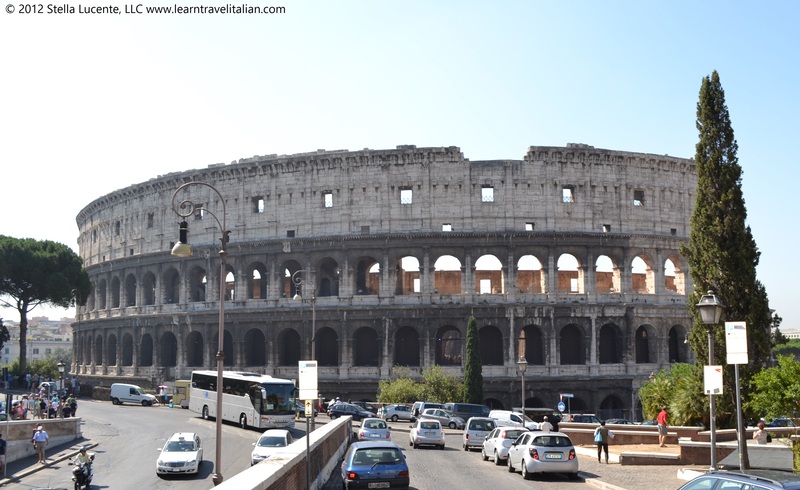 The Italian Cultural Notes section to follow, adapted from the Conversational Italian for Travelers textbook, focuses on how to use the Italian vocabulary needed to make and change reservations. Let’s start this Italian Cultural Notes segment with some basic phrases that will be helpful to know when calling or speaking to hotel personnel in order to make a reservation. To follow, we will learn about some general ways these phrases can be used. Ho una prenotazione. (I) have a reservation. …fare una prenotazione. …make a reservation. …annullare una prenotazione. …cancel a reservation. …cambiare una prenotazione. …change a reservation. …controllare una prenotazione. …check a reservation. …confirmare una prenotazione. …confirm a reservation. …ordinare la prima colazione. …order breakfast. Si, la camera è riservata. Yes, the room is reserved. Lei ha una stanza riservata per sabato. You (pol.) have a room reserved for Saturday. Both Italian verbs prenotare and riservare translate into English as “to book/to make a reservation.” Their corresponding nouns are la prenotazione and la riservazione. Although both nouns translate as the English word reservation, the use of each Italian word varies with the situation. 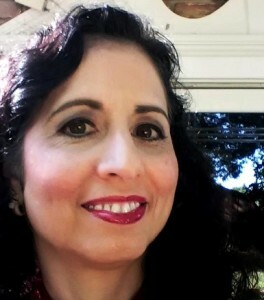 When boarding a train or entering a theater with a ticket that has a reserved seat, Caterina would have “un biglietto con la prenotazione,” or “a ticket with the reservation.” If Caterina wants to tell someone she is checking her seat to make sure she is in the right place, she would use the verb controllare, as in, “Controllo il biglietto con la prenotazione,” for “I am checking the ticket with the reservation.” Remember il controllore from Chapter 5 of our textbook Conversational Italian for Travelers, whose job it is to check tickets on passenger trains? However, the actual room in the hotel or seat on the train or theater is referred to as reserved with the past tense, as in “Il posto è riservato.” The seat has been booked, and no one else can use it. The word riservato can also be used as an adjective. If someone else had made a prenotazione before Caterina, her request might be denied because of una camera riservata, una stanza riservata, or un posto riservato! And what should we do if we want to confirm a reservation? Just say, “Vorrei confermare una prenotazione.” Finally, instead of vorrei, one could also use the verb desidero for I would like. Also, as always, be polite and add per favore to the end of the sentence! Follow Caterina and read about Italian girlfriends meeting at an Italian bar for cappuccino in the Conversational Italian for Travelers series of books! After Caterina settles into the routine of daily life with her family in Italy, her sister-in-law, Francesca, invites Caterina to have coffee and lunch with an Italian girlfriend. 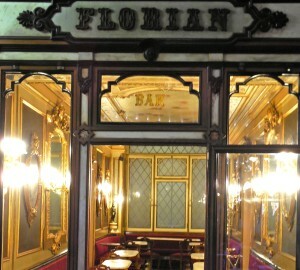 The women meet at an Italian café, also known as a bar, and order espresso coffee and sandwiches. They also meet someone special, so feel free to listen in on their Italian conversation at our website www.LearnTravelItalian.com and learn some Italian phrases of endearment for that special someone in your life! The Italian Cultural Notes section to follow, adapted from the Conversational Italian for Travelers textbook, talks a bit about the history of espresso and cappuccino and how each drink and its variations are made. 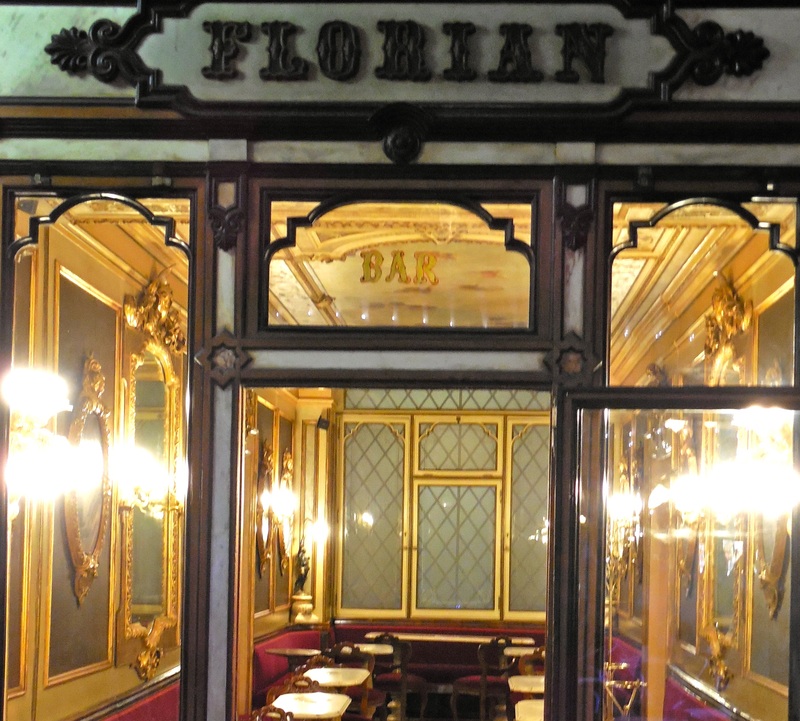 Read on and then order your own favorite Italian coffee drink—here or in Italy! Italian-style coffee, or caffè, has become so popular in America today that confronting the list of coffees available in an Italian bar may not be as intimidating as it once was. The list of specialty coffees offered by a coffee bar is usually displayed on a large sign behind the counter, opposite where one stands to place an order. Most Italians pay at the counter and drink their coffee standing up at the counter as well, often fairly quickly, before proceeding on to their next appointment. Space is at a premium all over Italy, and most coffee bars have only a few small tables. So, for the luxury of a seat, the price for the same coffee is slightly higher. But although the fee is higher, I’ve always felt that for visitors, it is nice to sit down at a table with a friend, have a waiter take your order, and have coffee and any pastries or sandwiches brought to you. Then relax and enjoy while watching the world go by! If you want an Italian coffee, keep in mind the general “rule” that most Italians follow: cappuccino in the mornings, usually before 10–11 a.m., and espresso later in the day. This “rule” may have come from the many well-meaning Italian mothers and their idea that milk is bad for digestion, although I don’t think anyone really knows how it started. Of course, if you like your coffee the American way, order a caffè americano any time! Read on for a few fun facts about Italian coffee drinks and what to expect to receive when you order an espresso- or cappuccino-type drink in Italy. In Italian bars, all coffee drinks are made by the specially trained barista (this title is used for men and women). Espresso means fast or quick and refers to the method of brewing the coffee. 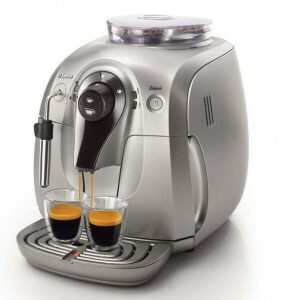 The classic espresso takes 7 grams of fresh, finely ground dark-roasted coffee beans, filtered under high pressure by an industrial espresso maker, with just the right amount of hot water to fill an espresso cup halfway to the top. There will be a layer of crema (foam) on the top as the result of the high pressure those large, gleaming stainless steel coffee shop machines can generate to make the coffee. For more information about how the modern-day commercial espresso machine came about and the components of these industrial espresso makers, click on this link from the Smithsonian magazine and this espresso equipment link. Add sugar or, for a caffè corretto, a shot of brandy or one of the other liquors always found on the shelves of coffee bars. 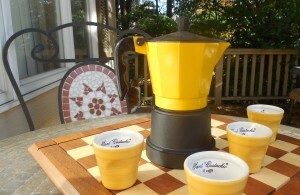 For a caffè lungo, extra water is added to fill the espresso cup to the top. For a ristretto, less water is used for the same amount of coffee grounds, to one quarter of the cup. The popular stovetop espresso maker that is part of every Italian household—and I mean every household—here and in Italy is shaped like an octagon. 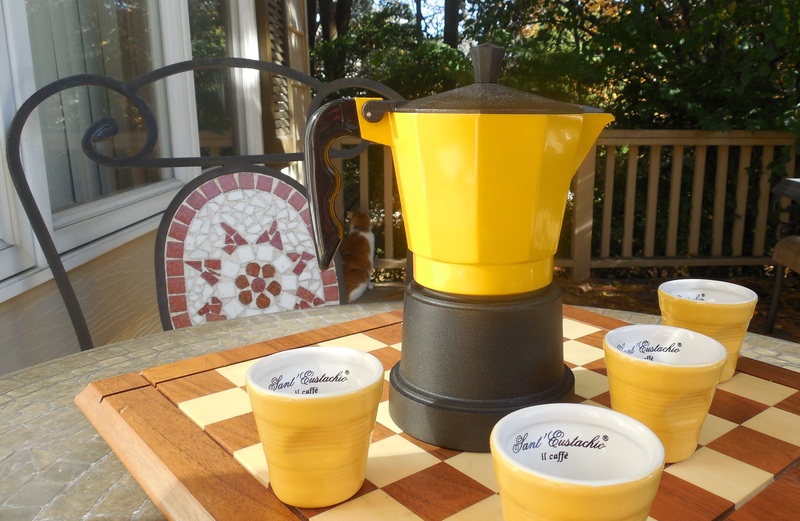 Don’t expect to get a real crema in this case, because this coffee pot does not operate under the high pressure of the industrial espresso makers, but this classic espresso pot is an easy, inexpensive, and convenient way to brew your everyday espresso. All stovetop espresso makers require very finely ground espresso beans packed firmly in place into a metal coffee filter that fits into the center of the pot. Freshly ground beans are, of course, best. Put water in the bottom half of the stovetop espresso pot, insert the filter with its coffee grounds, twist on the top, and heat over medium-high heat. The water in the bottom compartment will boil, and the steam will move upward through the coffee grounds in the filter to re-condense as coffee in the top compartment. From the Italian Bar—Cappuccino, Anyone? 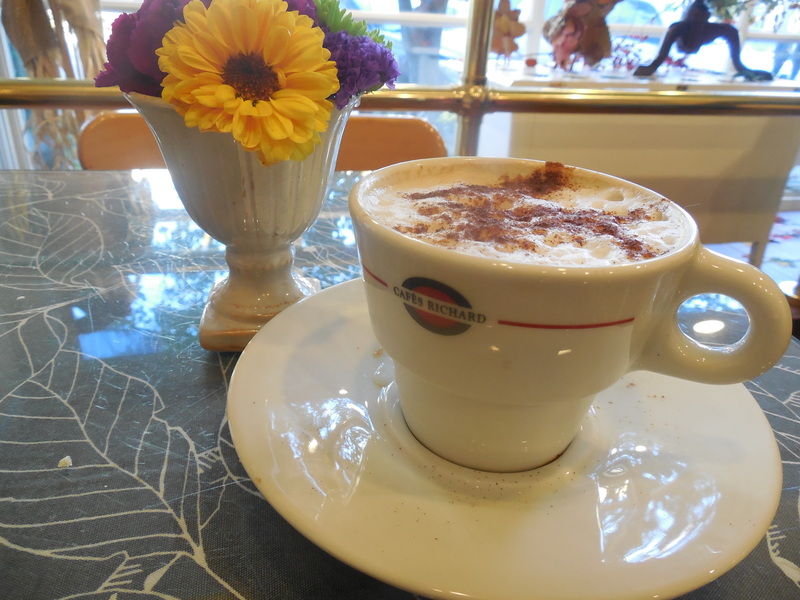 The Italian cappuccino drink that we know today is a fairly recent development of the 20th century, although historians have found coffee drinks with a similar name that date back to 18th century Austria. Cappuccino coffee is said to be named after the Italian Franciscan order of Capuchin monks, presumably because the combination of the dark brown color of the coffee and the milk froth (schiuma) that tops the drink is reminiscent of the white-faced monks in their habit with the distinctive dark brown hood. This short explanation begs the question, “How did the Italian Capuchin monks get their name?” In Italian, the word “cappuccio” means “hood.” Adding the diminutive “ino” ending for the coffee drink changes the meaning of the word into “little hood.” This may sound like a lot of trouble to go to just to name a coffee drink, although one should remember the Italian tradition of nicknaming people and food based on catchy associations that then become a part of Italian tradition. The now classic Italian cappuccino calls for three equal parts espresso coffee, milk, and milk froth, and is served in a large coffee cup. The milk froth is traditionally made by steaming low-fat milk with the wand attachment on the espresso machine. Gently stir in some sugar if you like, then sprinkle the froth with a bit of cocoa powder, cinnamon, or nutmeg. For a smaller coffee drink with milk later in the day, foam can be added to an espresso for a speckled drink called caffè macchiato that is served in an espresso cup. Above all, enjoy your cappuccino drink as a delicious start to your morning! Follow Caterina and shop Italian in the Conversational Italian for Travelers series of books! After Caterina settles into the routine of daily life with her family in Italy, her sister-in-law, Francesca, decides that they should go shopping. Although Francesca has grocery shopping in mind, Caterina would rather shop Italian at the many beautiful, fashionable shops that line the streets of Milan! To listen to this dialogue from Chapter 10 about Caterina and Francesca’s afternoon spent shopping in Milan, go to the interactive dialogues on our website at Learn Travel Italian Audio Dialogues. The Italian Cultural Note to follow, also from the textbook, gives some important information about Italian sizes, for YOUR next shopping spree in Italy. Buon divertimento! Visit Italy and Shop Italian! When visiting Italy, one encounters wonderful shops that sell everything imaginable. In most cities, beautiful, stylish clothing made by well-known designers hangs in the shop windows of the grand boulevards and larger piazzas. Think Via Monte Napoleone in Milan or the Piazza di Spagna in Rome. Now that the fall season is upon us, the cooler weather will bring with it the exciting new Italian fashions of the season. But maybe even more important for the shopper is what happens at the end of the fashion season in Italy. 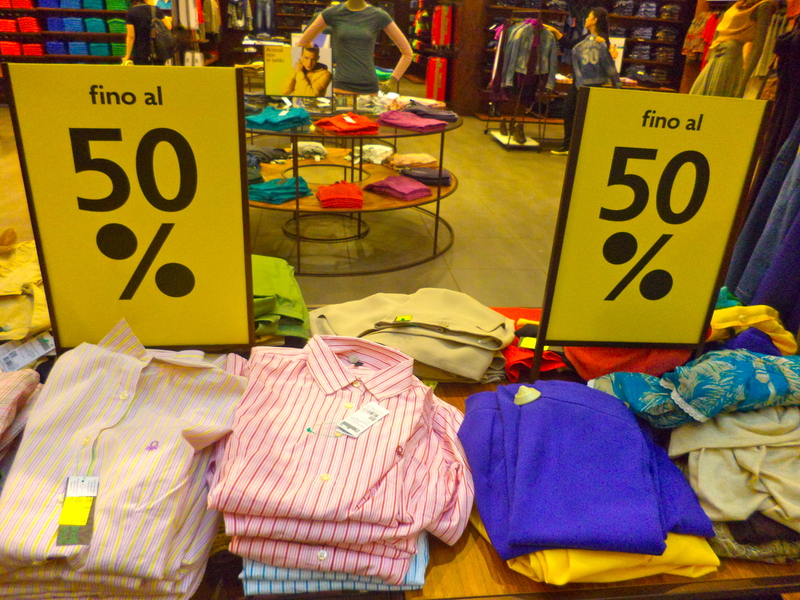 Usually in late June and July, corresponding to the height of the tourist season, it seems like almost all Italian fashion is on sale! Many clothing stores offer steep discounts, usually up to 50% throughout most of the store. 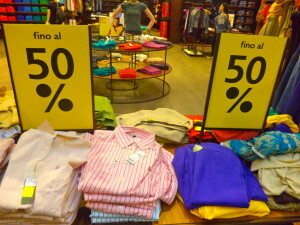 Look for the signs in the shop windows that say “saldi” for sale or “sconto” for discount. Late summer is a shopper’s paradise in Italy for those who love fashion! But one must be prepared to shop Italian. Sizes in Italy are different from those in the United States and from those in other European countries. How does one know what size clothing to bring to the dressing room? Also, when talking about Italian style, it should be mentioned that there are still dedicated craftsmen who make high-quality leather goods. There is such a dazzling variety of shoes in the shop windows that it is always tempting to buy a pair to bring home. But what size to tell the shopkeeper to get? The tables that follow list European and Italian sizes and how they (roughly) correspond to the sizes in the United States. Please note that this is only a general guide, and it is best to always try on any item of clothing before making a purchase! *Hint: Subtract 30 from European shoe sizes to get the equivalent of the American size for women’s shoe sizes 5 to 9. For men’s clothing, Italian sizes and European sizes have an identical numbering system, although the fit of the clothing that corresponds to this numbering system is only loosely standardized. As usual, trying on clothing before purchasing is the best policy! **Hint: Just subtract 10 from the European shirt and pant sizes to get the American sizes. Italian Cultural Notes: Shop Italian Fashion for Your Next Vacation! Visiting Italy? Follow Caterina for tips on how to read the Italian menus at your favorite restaurant—from the Conversational Italian series of books! Visiting Italy? Learn how to read the menu at your favorite Italian restaurant! After Caterina arrives in Italy, she stays with her Italian cousin Pietro and his family in Milan for a while and adapts to Italian life and the Italian language. Then, in the last unit of the book, they all go on a summer vacation together. Caterina and her family stay at a typical northern Italian lake resort in the town of Stresa on Lago Maggiore. Italian menus can look confusing to those who are new to Italian culture, but a few tips will help you understand how they are usually designed. Because most restaurants in Italy offer several courses, the Italian menu will usually list each course in the order in which it is to be served. Read on to the next section, Italian Cultural Notes, for a description of each Italian course, and find out what to expect when you order your own delicious meal in Italy! To listen to the dialogue from Chapter 16, when Caterina and her Italian family arrive at an Italian restaurant and begin their wonderful meal together, go to the interactive audio dialogues on our website at learntravelitalian.com/interactive.html. 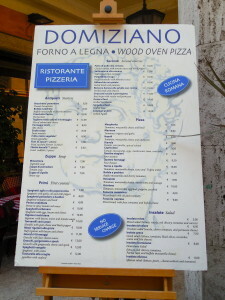 Italian menus may list different types of pizzas. Listed here are specialty pizzas made with a wood-burning oven in Piazza Navona, Rome, Italy. Italian menus reflect the typical Italian meal offered at most all Italian restaurants open for dinner, from the family-run trattoria, to the more formal ristorante (with a professional chef). The Italian meal consists of several courses. And, of course, there is almost always the option of dessert under the “il dolce” section listed on most Italian menus, or at least coffee at the end of the meal. Below is a list of the courses that comprise a full Italian meal, in the order that they usually appear on most Italian menus. When looking through Italian menus, expect to see a selection of appetizers (gli antipasti) listed first. Each region has its own specialties, which include a wide variety of vegetables (raw, preserved in olive oil or vinegar, or cooked), as well as cold meats or salami and cheeses. Salad can also be served as part of this course, but it is often eaten after the second course, when the main course has been completed. Salads are usually not formally composed but consist of fresh lettuce and whatever other fresh garden vegetables the chef has on hand that day (insalata mista). Hot antipasto may be served, with a variety of fried foods (fritto misto), very popular throughout the coastal regions of Italy. Soup (zuppa), often referred to as the most common type, minestrone (made with bean- and tomato-based broth and various vegetables and pasta), on Italian menus is well loved throughout Italy, and during leaner times, soups were a mainstay of the lunch and dinner meals. Soup may come after or replace the antipasto course. Appetizers and soups are always served with fresh bread (pane) typical of the region. The type of bread is not usually listed as a choice on Italian menus, because bread-making varies by region. That said, bread in Italy is always wonderful—either with a hard, crunchy crust and a soft center, like a French baguette, or soft throughout but golden brown on top, like a thick, light pizza (focaccia). Thin, crunchy breadsticks (grissini) are common throughout northern Italy. Bread in Italy can be eaten as is, or dipped in fresh, extra-virgin olive oil from a bottle that is provided along with the bread when one is seated. Butter—always unsalted—will only occasionally be found on the table as an accompaniment to the bread, and only in northern Italy. So if butter is not brought to the table with the bread, it probably is not available. When it comes to bread, just follow the local traditions for the best way to enjoy the type of bread each region has to offer! Next on Italian menus, we come to a list of starchy foods, such as pasta, gnocchi, or rice for the first course, or il primo. The word pasta means “paste” or “dough,” and refers to the method of mixing flour with water or eggs and then kneading the paste that is formed from this simple mixture until the gluten in the flour transforms it into a dough. The dough is rested, then rolled out and stretched, and finally cut into strands or put through a hand-cranked pasta machine at home. Commercial pasta machines, with their metal dyes that shape pasta into its many well-loved forms, and the ability of pasta to be dried and then cooked easily in a pot of salted boiling water, have allowed Italian pasta to become one of the world’s most popular dishes. Many restaurants in Italy will have a selection of fresh pastas made daily, and it is the custom to make all sauces from scratch using farm-fresh ingredients. Pasta in Italy is always cooked freshly and served “al dente,” which literally means “to the tooth” (a bit firm when chewed). Pasta is served promptly, so it is never soft or mushy. Italian short-grain rice (riso) when cooked in the Italian way is called risotto and is often served in northern Italy instead of pasta for the first course. The most popular types of rice grown in Italy are arborio and carnaroli. Italian rice is very starchy and is cooked slowly, with constant stirring, to bring out the starch and create a creamy sauce. No milk or cream is added! A variety of vegetables, seafood, or saffron can be added, along with a final enrichment of butter and cheese. How “soupy” the final dish turns out to be varies by region, but the rice itself is always a little firm, despite the constant stirring it takes to create the sauce. Il secondo, or the second course, always consists of meat or seafood, and with this course, a vegetable side dish, or contorno, can be ordered. The meat or seafood may be served alone or with one starch only, such as a potato or rice, so be sure to order your vegetables if you are a vegetable lover! Italians are very fond of vegetables and consider them as important as the meat or seafood in this course—important enough to be given their own listing on Italian menus! For those who like to finish their meal with something sweet, there is usually a wide array of offerings for the dessert course, or il dolce. Whether for an informal meal, a large, important gathering, or a special holiday, several dessert choices are usually listed on the menu. Il dolce may consist of fruit, nuts, cheeses, an assortment of pastries or ice cream, and of course, sweet wine (vin santo), liquors, and coffee. 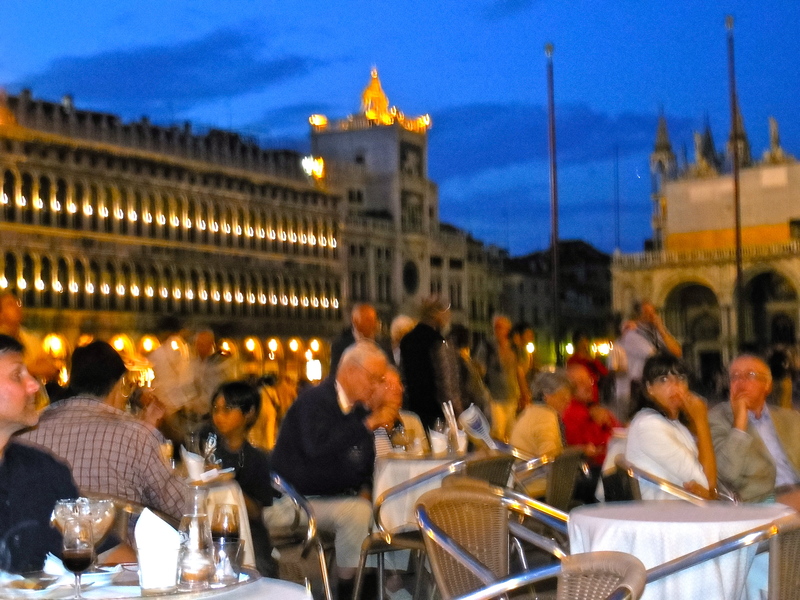 Try a full Italian meal “al fresco” one balmy evening in Italy, just the way the Italians do. 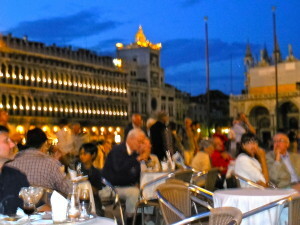 Watch the people stroll by as they take their evening walk, relax, and enjoy. You won’t be disappointed! —Adapted from Conversational Italian for Travelers, Chapter 16, “Cultural Note – A Typical Italian Menu” © 2012 by Stella Lucente, LLC. Visiting Italy? Follow Caterina for tips on how to order at your favorite Italian restaurant—from the Conversational Italian series of books! Visiting Italy? Learn how to order at your favorite Italian restaurant! After Caterina arrives in Italy, she stays with her Italian cousin Pietro and his family in Milan for a while and adapts to Italian life and the Italian language. Then, in the last unit of the book, they all go on a summer vacation together. Caterina and the family stay at a typical northern Italian lake resort in the town of Stresa on Lago Maggiore. For those travelers who are adventurous enough to try out their Italian on their own visit to Italy, read on to the next section, Italian Cultural Notes, for some phrases that will come in handy when ordering at an Italian restaurant. Get started by speaking with the waiter. A delicious meal is soon to follow! 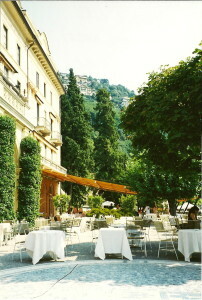 Italian restaurant at the Villa d’Este hotel on Lago Como ready for lunch. Below are some expressions that are commonly used when dining in a restaurant. The io (I) and noi (we) forms of the verbs potere (to be able to/can) and volere (to want) are important to know in this situation, because requests are usually made for oneself or for the entire table. “May I…?” and “Possiamo?” for “May we…?” to our list of polite phrases to use when making a request. To the popular “io vorrei…” for “I would like,” we add the conditional plural form, “Noi vorremmo…” for “We would like…” See Chapter 18 of our Conversational Italian for Travelers textbook for the full conjugation of these verbs in the conditional tense. …sederci vicino alla finestra? …sit by the window? …sederci a un’altro tavolo? …sit at another table? …avere il menù? …see (have) the menu? Qual’è lo speciale oggi/stasera? What is the special today/this evening? Che cosa ha scelto/avete scelto? What have you/you all chosen? …come antipasto, l’insalata mista. …for the antipasto, mixed salad. …come primo, le tagliatelle alla bolognese. …for the first course, tagliatelle with Bolognese meat sauce. …come secondo, l’osso bucco. …for the second course, braised veal shank. …come dolce, solamente frutta. …for dessert, only fruit. …fatto con noci/arachidi. …made with nuts/peanuts. Questo è troppo caldo. This is too hot. Questo è troppo freddo. This is too cold. …dell’acqua senza gas/naturale? …some water without gas (natural water)? …dell’acqua con gas/frizzante? …some sparkling water? …del pane/più pane? …some bread/more bread? …del sale e pepe? …some salt and pepper? …un cucchiaio, un coltello, una forchetta? …a spoon, a knife, a fork? Cin cin!/Salute!/Alla tua salute! Cheers! (To your) good health! Adapted from Conversational Italian for Travelers, Chapter 16, “Important Phrases – Speaking with the Waiter,” © 2012 by Stella Lucente, LLC. Read on to the next section, Italian Cultural Notes for some important tips. Cultural Notes: Drive Italy! When in Rome, Drive as the Romans Do! The Italian Cultural Notes section below, also from the textbook, describes the exciting new high-speed Italian trains of the Freccia and Italo railway systems that have streamlined travel between the major cities in Italy. After Caterina’s plane lands in Italy in the first chapter of the book, she takes a taxi to the main train station in Milan, where her cousin Pietro meets her. She is lucky to have a relative who can drive her in Italy to her final destination in Milan. For those who do not have a personal chauffeur to take them on a tour of Italy, or who just want to rent a Ferrari as part of their dream vacation, I have included in the book some tips on renting cars in the “Cultural Note: Drive Italy!” section in Chapter 6, which have been adapted for this blog. Read on to the section that follows, Italian Cultural Notes. The Italian railway system is the most efficient way to travel throughout Italy, especially for the tourist with a limited period of time to spend. But for those for whom driving the autostrada in a Ferrari has always been a dream (see www.red-travel.com), or for those who have enough time to spend to really get to know the countryside (www.italylogue.com/agriturismo), here are a few tips about what is needed to rent a car and drive in Italy. A quick search of the Internet for “rent a car in Italy” yields many companies that promise quick and easy deals. Auto Europe is not a car rental company, but a car broker that allows the traveler to book online, and it offers several additional services (www.autoeurope.com). Auto Europe is recommended by Slow Travel Italy, which can also be found on the Internet at http://www.slowtrav.com/italy/planning/. Here are some of the benefits that Auto Europe can provide for the renter: competitive pricing, a list of what is included for the price, pickup and dropoff at different locations within Italy at no extra charge, and a 24/7 customer service line that will help the traveler handle any issues encountered on the road or with the local rental company. 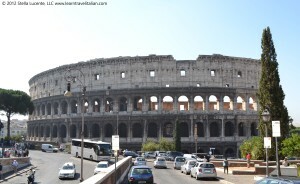 Note that commonly included fees when renting a car in Italy include taxes, a surcharge for picking up the car at the airport, and possibly a daily road tax. Insurance is necessary to drive in Italy and can significantly increase the price of the rental when obtained through the rental company, so it is worthwhile to check if you can get cheaper insurance through a credit card company. Picking up a rental car at the airport can be difficult at peak travel times because of long lines, and during off-hours, when parts of the airport may be closed. In addition, many Italian hotels, especially if located centrally within a city, do not have parking available for their guests. There are tolls on most Italian freeways, and gas is expensive in Italy. It may be easier to take the train to your initial destination and pick up the car the next day or when you are leaving for the next city on your trip—again, public transportation in most cities is excellent. The city streets in Italy are narrow, so remember that a smaller car is probably better than a larger car, as long as luggage and family will fit! Here is a checklist of things to find out before leaving the rental office: (1) whether the car takes unleaded gas (benzina) or diesel (gasolio), (2) how to put the car in reverse, (3) how to lock and unlock doors and windows, (4) whether a reflective vest and other equipment required by law in case of an accident have been provided (in the trunk), (5) whether a GPS or map of the town where you will be driving is available, and (6) whether you can get a parking disc for the car. “Cultural Note” © 2012 by Stella Lucente, LLC.